About a year ago, in a rushed effort to find the charger for my mobile, searching everywhere, I stuck my head under my bed in case it got kicked under there the night before. I saw a big IKEA box which stirred my curiosity. I couldn’t remember why that was there and what was in it. Distracted from the charger I pulled it out and immediately that feeling of disappointment washed over me. 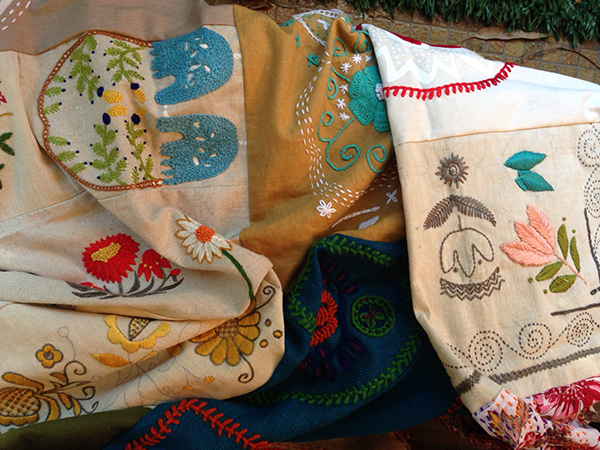 About half a dozen unfinished embroidery and tapestry projects neatly folded waiting to be loved again. I felt immediate self-judgement and a sense of failure. As artists and crafters we are surrounded by unfinished projects. This is normal but we torture ourselves with the guilt and we dive into new projects to fix our previously perceived failures. I want to show you how you can effortlessly eliminate the disappointment and guilt which also serves as the thing that holds you back from creative freedom. It’s how I got through not only that IKEA box but have since cleared out every unfinished craft project. But not in the way you might think. Firstly understand that our minds can’t leave open loops alone. By nature we are drawn to closure and results. Having open loops leaves us with anxious niggling thoughts at the back of our minds. And when we add a belief that we ‘should’ have done something then that niggling thought also turns into guilt. Our guilt and anxiety are not there because the project is “unfinished” it’s because we’ve classified it as “unfinished” and thus a “failure”. We tell ourselves a failure story every time we see our bags of half-done craft, just like I did in that moment of seeing the contents of that box. The half-done craft, by itself, doesn’t mean anything. We are the ones that add the meaning to it. You might call yourself the “queen of unfinished craft projects” or you might say “I’m really good at starting but really bad at finishing my craft projects” but that’s just a chosen perception. Take out all your projects right now, lay them out on the floor or table and classify them using some examples below. 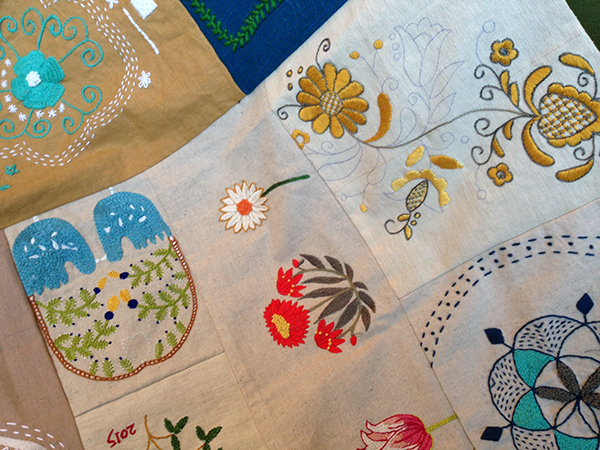 These four are “experiments” and will be stitched together into a sampler. These two half-finished cushion embroideries served as colour tests and now I know that the brown and purple don’t go together. Before that I would not have known this. I can keep this as a reference check in my ‘experiments bag’. This large half-done wall-hanging is in a perfect state to donate to charity, I will pack it up together with the remaining colour threads and instructions and a short letter to the next person who will buy it. This table runner with Christmas designs can easily be unpicked and I will reuse it. I’ve changed my style since I started it two years ago and I no longer enjoy working in these colours and designs. Although I have not finished the entire design, this piece looks finished enough. I do not need to fill the rest of the fabric with 15 more flowers and leaves, the single flower in the centre is dramatic and I will use this as a small wall-hanging. This small strawberry design will be perfect for my niece to finish when she visits next. I will teach her how to do a simple back stitch and she can add the leaves finishing the piece and giving us both a sense of satisfaction. Plus it will be a joint project and she can keep it! This project no longer brings me joy, I feel ok about discarding it. I still love this and will finish it but I will change the design and colours slightly to make it feel like a renewed project. You see, you don’t need to go ahead and actually finish every single project that’s hidden under the bed, make it amazing, hang it on the wall, mount it on mahogany dowels. You don’t need to set aside days, weeks and months of work to finish every single project. This is YOUR creativity on YOUR terms and it should bring you joy. Living with hidden piles all over the house is not joy. This exercise is all about closing those open loops and laying your guilt and anxiety to rest. Creativity is a full process of experiments, changed minds, failures and successes. You choose what you call your projects and that shapes your mindset for your future projects. My sampler. Stitched up of lots of bits and pieces of experiments and unfinished projects. Just be mindful; it’s not enough to give your projects names of “experiment”, “charity donation” and “sampler” and then put them all back into the dark cupboard! Haha! You do actually have to put them to use like in the examples above. It’s about moving your projects forward, creating momentum and not remaining in stasis. It’s also about being kind to yourself about how you judge your projects. I strongly recommend going through a decluttering and clean-up process of your projects and materials. Bring yourself to a place of renewed readiness and give space to your creativity with a new mindset of what ‘finished’ means to you. I’d LOVE to hear from you! How do you deal with your unfinished craft? 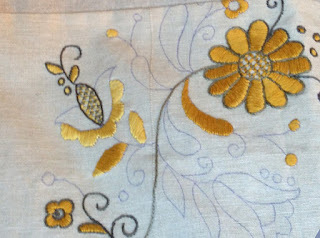 Is there a specific reason you don’t finish your embroideries? Do you have And if you’ve followed the above steps let me know how you went. I read all my emails.